Imagine trading 50% of the ownership of Domino’s Pizza for a VW Beetle, a used one at that. Is it something that you would do, or even consider doing? Well certainly not today, but place yourself in the shoes of one of the co-founders of the then young company, without the benefit of knowing the future, and perhaps your point of view would be different. Hindsight, after all, is a wonderful thing. We’re well versed in the tragic stories of individuals and companies that make seemingly sane decisions one day, only to have it bite them in the rear later on. Some of the most notable examples would have to be Excite rejecting an offer to buy Google for $1 million, Blockbuster rejecting an offer to buy Netflix for $50 million, and the big ones, Ronald Wayne selling his share in Apple for $800 and Nolan Bushnell turning down one third of Apple for $50,000. Disasters such as these make for amazing reading, but could you imagine being in their shoes? Domino’s Pizza needs no introduction. They are one of the world’s leading fast food chains, acting as the savior of oh so many parties over the decades. But as big and successful as they are today, it wasn’t always that way. In fact, Domino’s was at one stage a floundering, solitary pizza shop run by two brothers. Way back in nostalgic 1960 America, two brothers, Tom and James Monaghan, bought a small pizza shop in Ypsilanti, Michigan, called DomiNick’s. A small purchase by today’s standards, they paid only $900 for the pizza outlet, securing the purchase with a $75 down payment security. Like all small business owners, they hoped for success. Who could blame them? But success isn’t always guaranteed, and in an industry such as restaurateur’s, excessive work at horrible hours is demanded. After only eight months in the small business, one of the brothers had had enough. James wanted out. Now James didn’t walk away empty handed. He traded his 50% share in the future Domino’s Pizza for a secondhand VW beetle. To James it must have seemed the dream deal. No more grueling hours, out of a struggling business, and a set of wheels. If only he had a crystal ball. Tom battled on in his small pizzeria, and in 1965 he decided to drop the name DomiNick’s for the now familiar Domino’s Pizza, inc. Things were beginning to take a positive turn for Tom, and a short two years later he opened his first franchise store in Ypsilanti. It was to be the first of many around the world, with the 200th store opening in 1978, only eleven years later. In 1998, Tom retired, having successfully run the company for 38 years. He sold 93 percent of the company, and a year later a new CEO was appointed. 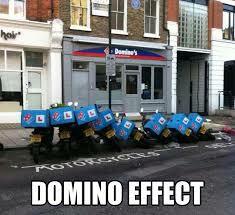 What did he get for 93% of Domino’s? Let’s just say that it was quite a bit more that a secondhand VW Beetle. He actually got $1 billion. Ouch for James. It has certainly got to be the most expensive VW Beetle in existence, and certainly Hitler’s curse in this instance. The guy blew a billion dollars for a piece of crap car. He could have bought a fleet of cars, or heck, even a jet for his share in Domino’s. But, such is life.